Hey, hey! 4th Fiesta Friday. Angie is a wonderful hostess, I’m delighted to go with my Petite Paniere full of surprises. Today, something sweet and full of flavor to share with you. 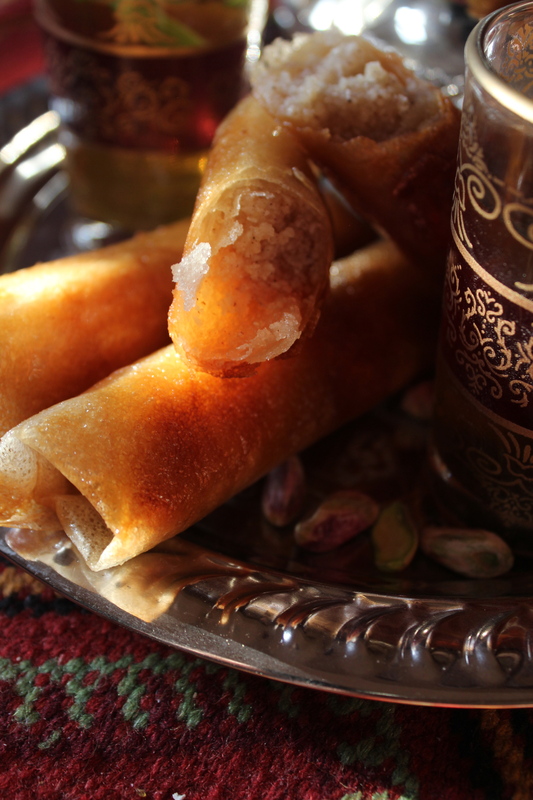 Almond Cigars are made with a dough called Diouls sheets or Brick sheets. It’s made with fine semolina a pinch of salt and spread with water. 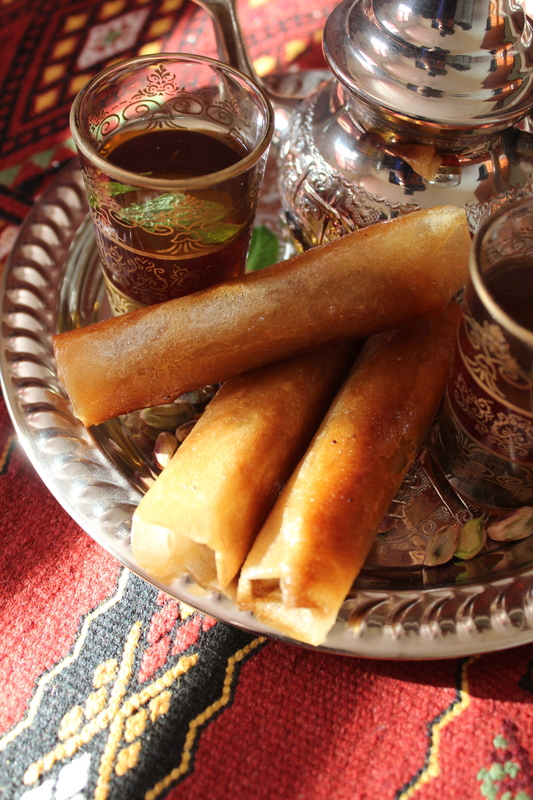 This pastry sheet is very popular in Algeria and in North Africa as a savory or as a sweet dessert. They are sold flat and round and they dry out very quickly, leave them with a clean kitchen towel and they cook perfectly in the oven. In a large bowl, add the ground almond and the sugar. Add the cinnamon and mix. Pour slowly the orange water blossom until the dough becomes assembled, like almond paste and set aside. Take one sheet and add a little of the stuffing (a small roll of 10 centimeters) with a teaspoon at 3 centimeters of the edge of the sheet. Fold the edges of the sheet (right and then left). Fold the stuffing edge and roll slowly, you have a cigar shape. Proceed the same way for the rest of your Diouls sheet. In a cooking, pan adds a little of sunflower oil on a medium heat. Cook the cigars until they become golden color. Remove from the heat and drain it into a colander, set aside for 15 minutes. In a small cooking pot, add the honey (I choose a honey orange blossom for this recipe). Cook on a low heat. When the honey is warm, deep the cigar, one by one into the honey. Remove from the pan and put them into a serving dish. 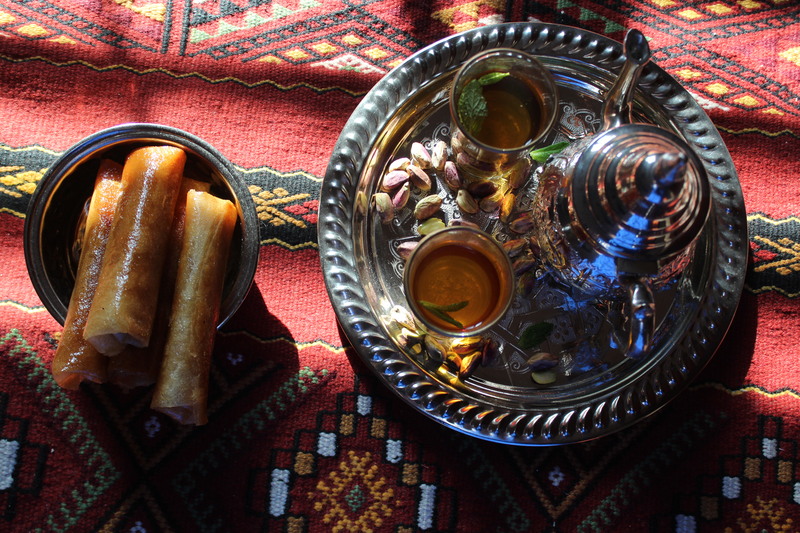 Serve Almond Cigars with a hot North African mint tea. The smell of the fresh mint, the honey, the orange flower blossom and this delicatessen are sweet and invite you to relax. PS: They come in different shapes, cigars like today, triangle or round like a snail. For this recipe you can use Filo dough, I suggest you cut in half the filo sheet, it will be easier for working because Filo dough is much bigger than Dioul dough. Note, this is not Filo (sheet) Dough! Thank you Nancy and it’s a pleasure to share. If you don’t have Diouls around your area you can use Filo dough, it’s the same process. These look so lovely, especially with the tea setup you have here. I learned so many new things from your post today! Lovely cigars my dear and gorgeous pictures! I loved your props and dark hue pictures…. Complimenting each other so well :). Yes and we appreciate little small moments in life. These are unique and lovely. Happy to have found your blog through FF#4! Great fun, isn’t it? Absolutely gorgeous presentation, Linda. I feel like I walked into a tea house in the Middle-East. These almond cigars seem to taste like their cousin baklava. Perfect with tea as you have demonstrated. The pastry sheet is completely new to me. Your almond cigars look wonderful! These look so yummy and perfect with a nice hot cup of coffee! I have some phyllo in my freezer and might give this recipe a try this weekend! Yum! Mon pêché mignon !! C’était une des spécialités de ma maman ( Allah yarhamha) mais elle faisait la pâte elle-même .Bien sûr avec dioul c’est très bon aussi et surtout c’est vite fait ,mais il faut consommer de suite,pour les soirées ramadanesques !! Je mettrais la recette un jour sur A C .
Ça a l’air délicieux avec la fleur d’oranger et surtout les photos sont superbes. Almond cigars look so delicious! Beautiful photos! I have filo sheets, so I’ll try to make cigars, hope will be not much difference? Thank you so much :)This is the same taste, filo sheets are just more fragile. Merci beaucoup Neila. J’adore ces cigares, simple a faire et l’odeur de l’eau de fleurs d’oranger embaume…Merci pour ta visite. I shouldn’t visit your blog when I haven’t had my breakfast Linda…j’ai faim!! et tes photos sont trop belles and enchanting! bravo bravo! Is this the same dough that is used for algerian bourek?